On Sunday 18/09/16, Nigeria’s Minister of Foreign Affairs, Mr Geoffrey Onyeama, was reported to have told newsmen in New York that President Buhari's administration is still detaining the Leader of the Islamic Movement in Nigeria, Shaikh Ibraheem Zakzaky because it is studying the report of the Judicial Commission of inquiry set up by Kaduna state government. The Islamic Movement in Nigeria (IMN) believes the statement credited to the Minister is ridiculous to say the least. It seems he actually had nothing to say on the crucial reason why the Nigerian government is still holding the Sheikh hostage, even though he is above 60 years, after killing all his children, senior Sister and 1000+ of his followers since December 2015. It is a well known fact that the revered Leader of the IMN was abducted and illegally detained without charges for over nine months now in contravention to the Nigerian constitution and violation of the Sheikh’s fundamental human rights. We believe his illegal detention has nothing to do with the Judicial Commission of Inquiry (JCI). He is not being detained by the JCI nor is he detained on its recommendation. In fact the JCI had to extend its period of sitting to seek ways for the Sheikh Zakzaky’s legal team to meet with him in detention. In fact the JCI was even inaugurated while the Sheikh was already in detention. More so, the issue of his detention was not discussed by the JCI during its sessions nor did it bother to make any issue of it. Sheikh IbraheemZakzaky is being detained by the presidency under the Department of State Service (DSS) and not by the JCI. The DSS even told the court that the revered Sheikh was under ‘protective custody’ and with his consent after refusing to allow his lawyers to receive regular briefs from him. Even though this statement is a blatant lie by those holding the Sheikh hostage, why didn’t the FM echo it to the world’s press? The DSS told this to the court to dismiss the saying that the revered leader is being detained illegally without any charges. If his detention had anything to do with the JCI, the DSS would have told that to the court. But it didn’t because his detention had nothing to do with the JCI. Even the way the Minister answered the question was apologetic and defensive trying to show a good image of the government, which has already been condemned by highly reputable international human rights organizations in the world. The Zaria massacre has dented the human rights image of the Nigerian government in the international scene and the government is battling to defend itself and present the opposite. Considering the fact that Sheikh Zakzaky sustained life-threatening gunshots and in dire need of urgent medical attention, how can study of Kaduna JCI recommendations make the government to delay justice? 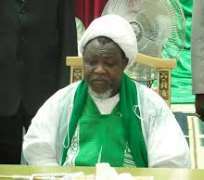 If Sheikh Zakzaky is released now, will that tamper with their study of JCI report? We believe it will not. It will only show the world their intent in doing justice in the case of Zaria massacre. We therefore wish to reiterate our demand for the unconditional release of Sheikh Zakzaky, his wife Malama Zeenah Ibrahim, the 200 IMN members detained in Kaduna prison and the hundreds missing,who we believe are being detained by military authorities secretely since the Zaria massacre.